Tag line: "Go big or go extinct"
Looking back over the films I’ve covered thus far during my challenge, I was amazed to learn I haven’t watched many of the Kaiju movies that Toho Studios turned out over the years (Kaiju is a Japanese word that means “strange monster”). In fact, the only Kaiju I’ve included thus far has been Mothra, which is really sad when you consider I spent a big chunk of my childhood watching flicks like Rodan and the Godzilla series on Saturday afternoons (in addition, when I was 6 years old, my two favorite TV shows were re-runs of Ultraman and Johnny Sokko and his Flying Robot). What’s more, I’ve also ignored the great Guillermo del Toro (to date, I haven’t covered a single one of his films!) So, with 2013’s Pacific Rim, a big-budget action / sci-fi movie about gigantic monsters, I’m killing two birds with one stone. Mankind is locked in a struggle for its very survival, fighting giant monsters (called “Kaijus”) that have made their way through a crack in the sea floor. To defeat these creatures, which are big enough to destroy entire cities and kill tens of thousands in the process, the world had to create some monsters of their own, mega-sized robots they’ve nicknamed Jaegers (a German word meaning “hunters”). Controlled by two pilots, the Jaegers have, for years, been man’s only line of defense. But when the Kaiju start getting bigger and stronger, more and more Jaegers are destroyed. Before long, the governments of the world decide to retire the Jaegers, opting instead to construct a large wall designed to protect the major cities. When this, too, fails to stop the attacks (which are also occurring much more frequently), the fate of the earth once again rests in the hands of the now-renegade Jaeger program, which, under the command of Stacker Pentecost (Idris Elba), continues to battle the Kaijus. In fact, Pentecost and his crew have devised a plan that, if successful, will seal the breach at the bottom of the Pacific once and for all, thus preventing any future Kaiju attacks. But he’s going to need more Jaegers to pull it off. So he enlists the help of former pilot Raleigh Becket (Charlie Hunnam), whose brother (and co-pilot) was killed in battle five years earlier. But can the Jaegers complete their mission in time, or will the world be overrun by giant monsters? Like Toho’s Kaiju movies, it’s the spectacle that makes Pacific Rim so entertaining, from the design of its monsters (all of which are unique) and the massive destruction they cause (in the opening moments of the film, we watch a Kaiju demolish San Francisco’s Golden Gate Bridge) to the battles waged between these creatures and the Jaegers (one particular fight, which occurs late in the movie, practically levels Hong Kong). Thanks to some impressive CGI (the best I’ve seen in years), Del Toro and his team bring all of these aspects convincingly to life, giving us one hell of a fun motion picture. 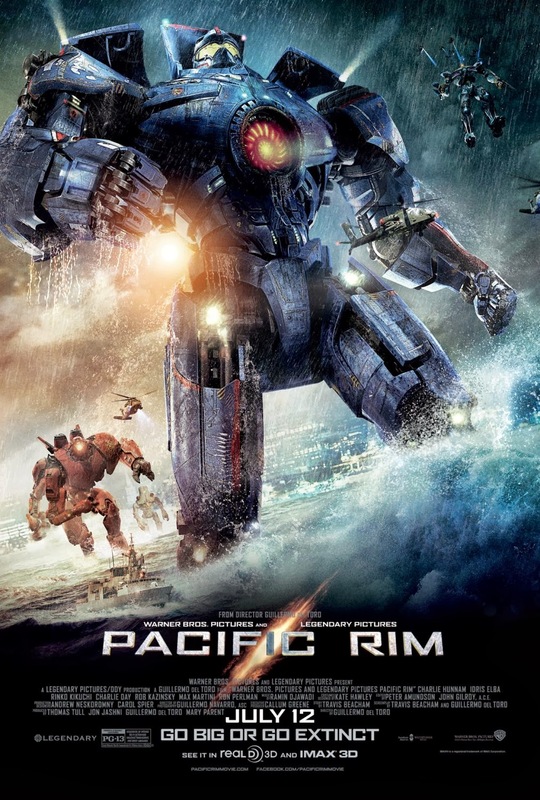 And yet, like most Del Toro films, there’s more to Pacific Rim than mindless action and special effects. The relationships that develop between the Jaeger co-pilots are intensified by a process known as “the Drift”, where the minds of the two pilots are melded together, forming them into a single unit and thus a more efficient fighting team (the scenes depicting “The Drift” are as cool as those featuring the Kaijus or Jaegers). The selection of Raleigh’s new co-pilot also raises some issues; he wants Mako Mori (Rinko Kikuchi), a young woman who, in simulations, has destroyed 51 Kaijus in 51 attempts. But Stacker Pentecost, who’s been like a father to Mako since her parents were killed in a Kaiju attack, fears she may snap under pressure and allow her hatred of the monsters to cloud her judgment. The Kaiju / Jaeger confrontations are, indeed, outstanding, yet amidst all the flash and flair, Del Toro gives us a little something extra as well. I had a blast watching Pacific Rim. More than this, though, it reminded me of the great Kaiju pictures I fell in love with as a kid, and also has me chomping at the bit to see Pan’s Labyrinth, The Devil’s Backbone, and the two Hellboy movies again. Here’s hoping Pacific Rim has this same effect on others. The perfect summer blockbuster. Only problem was that the characters were so thinly-written and boring. Good pick! Ideal definition of a summer blockbuster in every way, and that much more enjoyable because of it.